i have another wedding baking gig upcoming up sometime this october thanks to one of my coworkers' friend who is getting married. last october i baked a bunch of goodies for the friend who is getting married now's sister. this time around, this sister is asking for the same red velvet cupcakes with cream cheese frosting and vanilla cupcakes with salted caramel buttercream; in addition to a bunch of french macarons as well. those macaron flavors are still to be decided. anyway, i mentioned i could make all these cupcakes with these flavors. well, as it turns out, i'd never really made salted caramel buttercream frosting before! hehehe oops, i know. but i have made caramel and salted caramel (from scratch) before. so to make sure i could actually do it, i did a test bake last night after my one of two strength training workouts for the week. 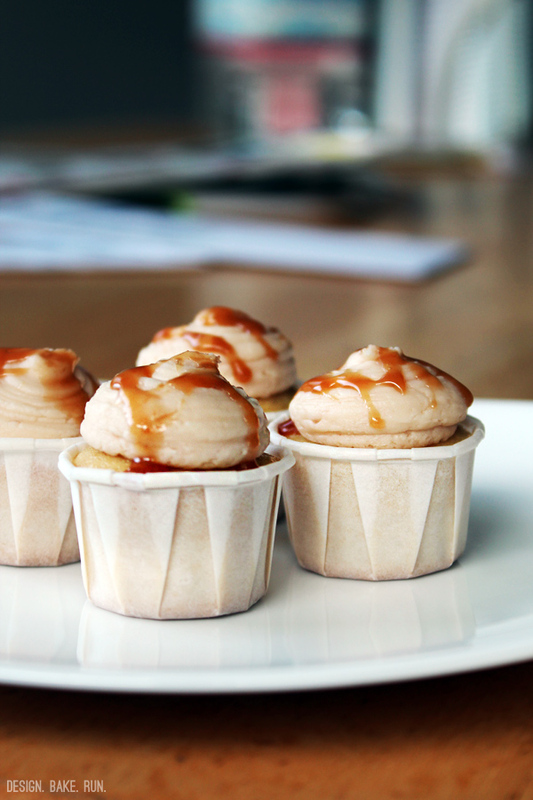 i used my go-to vanilla cupcake recipe these days and still had some leftover caramel sauce in the fridge i had made not too long ago. long story short, my first attempt of salted caramel buttercream was somewhat successful. why only somewhat? because i'm not sure how much salt you can taste in the "salted" part of the salted caramel buttercream/sauce. i forgot to put the salt in my sauce when i was melting it and threw it in at the last minute while making the buttercream. regardless, i'll make the sauce again and remember to actually put some sea salt in it before making the actual buttercream. i think this salted caramel buttercream is a keeper and goes so well with any cupcakes. using a hand mixer or a stand mixer, cream together the butter and salted caramel sauce in a good size bowl until incorporated. then add in the confectioners' sugar and mix until you have the right consistency. if it looks like it's a little thick, add in some milk or cream to thin it out. if it's too thin, you can add in more sugar. once you have the right buttercream consistency, fill your piping bag and frost away. makes enough to frost 24-26 mini cupcakes. you can double the recipe if you like for frosting more cupcakes. Pour the cream into a small, heavy saucepan. Then add in the 1/2 teaspoon vanilla extract. Place over medium-high heat and bring to just under a boil, stirring occasionally. Reduce the heat to low to keep the cream warm. In a medium, heavy saucepan, combine the sugar, water, sea salt and corn syrup. Bring to a boil over medium heat, stirring to dissolve the sugar. Then cook, without stirring, until the mixture is amber colored, 5 to 8 minutes. Remove from the heat. The caramel will keep in an airtight container in the refrigerator for up to one month. *note: Use a good-sized pan when preparing this caramel. When the hot cream is added, the caramel will boil furiously at first, increasing dramatically in volume. Have ice water nearby in case of burns. I am currently craving these after seeing some mini cupcakes on the television! 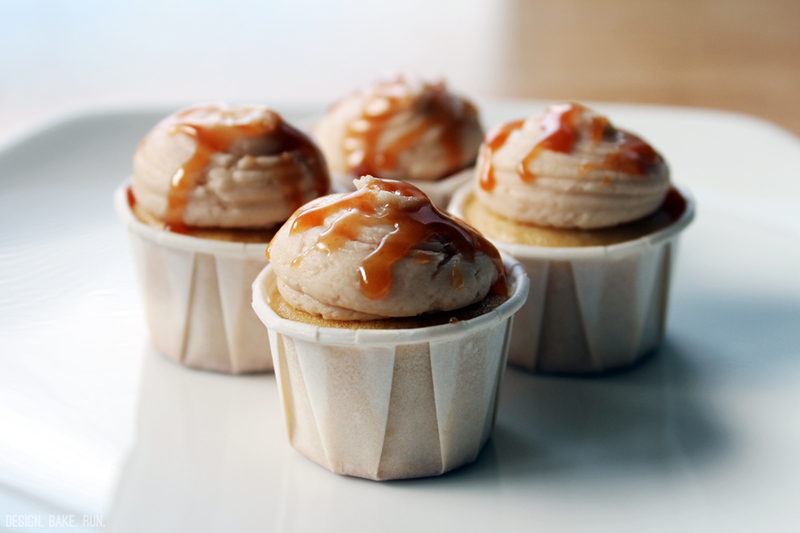 I've had salted caramel cakes before and they are by far my favorite cupcake!! Hi Melissa. Thanks for stopping by. I know what you mean about craving especially after seeing them on TV or pictures of them elsewhere. These cupcakes are good. They're one of my favorites as well.